Modeling and simulation of molecular systems have become inseparable components of modern research in molecular biology. In particular, molecular dynamics simulation is increasingly used to investigate the mechanism and structure-function relationship of a wide range of biological macromolecules. 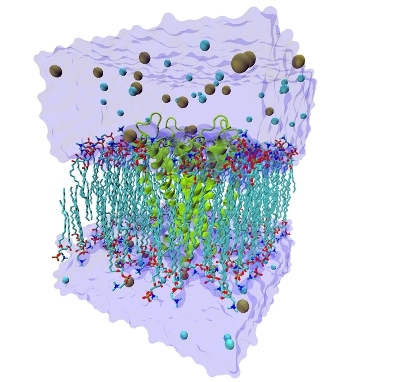 The course will present a brief introduction to such methodologies, and uses membrane proteins as an example of how computational biophysical methods and simulation technologies can be applied to biological problems. The molecular systems used as examples will include biological water channels, as well as carbon nanotubes as artificial materials used in nanotechnology. The goal of the course is to walk the participants through various steps involved in modeling, simulation setup, and analysis of the results of molecular dynamics simulations and discuss what can be learnt from simulation studies of these systems. The lectures are accompanied by hands-on tutorials in which the students can set up and run simulations on their own. This workshop, hosted by Emad Tajkhorshid, will take place on November 28 – December 1, 2011. It is designed for graduate students and postdoctoral researchers in computational and biophysical areas. Working familiarity with the VMD and NAMD software used in the workshop is assumed. Streaming video of a recorded lecture, tutorial self-study, and Skype/phone contact with the instructor are used to deliver course content. Enrollment is limited to ten participants. There is no fee for the workshop.